Two-Pipe System with Air Vents? What kind of weird radiator is this? Slow Heating Radiator? With Thermal Images! increasing radiator size to balance house temperatures, its effect on fuel use. 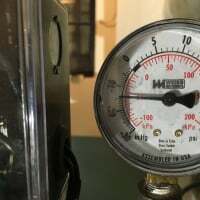 what pressure level should be used for a 15 section cast iron steam boiler? Will unused (and undrained) main of steam system corrode if not repaired?